LG OLED55B7P vs OLED55B7A : Any Differences that You Should Know? Posted on Monday, August 28th, 2017. - Filed under 55-Inch. From their model name, We can easily guess that LG OLED55B7P and LG OLED55B7A are two almost similar models. They are indeed introduced by LG as part of their 2017 OLED TV lineup. But is there any difference between them that We should know? I’m quite sure that you are interested to know more about those two TVs as well as their differences if you are considering those two TVs as your next 55-Inch 4K OLED TV. 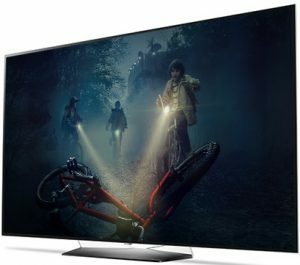 Let’s talk about LG OLED55B7P and OLED55B7A and their difference in this article. What You Should Know about LG OLED55B7P? LG OLED55B7P comes as one of two screen size options of LG B7P model. The other one is the larger 65-Inch screen. LG OLED55B7P comes with OLED Panel that can deliver perfect black as its pixels can be completely powered off and infinite contrast with its pixel level dimming. The screen is also completed with True Color Accuracy for accurate color details and ultra luminance to deliver better peak brightness. LG OLED55B7P is also completed with 4K Upscaler to bring brilliant picture not only from original 4K content sources but also from HD contents that upscaled into near 4K picture quality. HDR technology that installed in LG OLED55B7P is Active HDR that can deliver better details and contrast from your HDR content sources. The HDR technology supported are Dolby Vision, HDR10 and HLG so that you can enjoy HDR contents from wide range of content sources. WebOS 3.5 is installed in LG OLED55B7P as its Smart TV platform. With WebOS 3.5, you can enjoy premium entertainment from your favorite HDR content sources. You can also run additional apps with the access to LG contents/Apps Store. Controlling the TV and WebOS is also more convenient with magic remote that comes with LG OLED55B7P. What You Should Know about LG OLED55B7A? LG OLED55B7A is the newer model introduced by LG few months after LG OLED55B7P. It’s introduced as part of LG B7A model that consist of 65-Inch and 55-Inch screen size option. LG OLED55B7A comes with OLED panel that can deliver perfect black that completed with pixel level dimming. So that you can enjoy pure black level on your screen while enjoy infinite contrast since each pixels of OLED are autonomously controlled. Ultra Luminance is also installed in LG OLED55B7A to bring greater details on the bright part of the screen. HDR technology of OLED55B7A is Active HDR that can deliver expanded details with better contrast vibrancy from your HDR content sources. We can also find WebOS 3.5 as the Smart TV platform of LG OLED55B7A. With WebOS 3.5, you can enjoy premium entertainment such as movies, sports, TV shows and music while also able to run additional apps from LG contents/Apps Store. You can also control the TV and WebOS more conveniently with magic remote that completed with natural voice recognition. We need to know the specs and features of LG OLED55B7P and OLED55B7A before We can talk more about their differences. The key specs and features of those two 55-Inch LED TV can be found on the table below. Let’s take a look together. Although in most of its specs and features LG OLED55B7P and OLED55B7A are similar, there are indeed few differences between those two 55-Inch OLED TV. What are their differences? Let’s talk about that together. LG OLED55B7P already supports Dolby Atmos, while LG OLED55B7A doesn’t support Dolby Atmos. With Dolby Atmos Support, LG OLED55B7P is able to deliver more beautiful and richer sound than LG OLED55B7A that doesn’t support Dolby Vision. Both of LG OLED55B7P and LG OLED55B7A come with 40W speaker power output, but their speaker type are actually different. LG OLED55B7P comes with 2.2Ch speaker type, while LG OLED55B7A comes with 4.0Ch speaker type. 2.2Ch speaker type allow you to enjoy richer sound quality than 4.0Ch speaker type. In combination with Dolby Atmos, you can enjoy more beautiful sound in LG OLED55B7P. Summary : LG OLED55B7P or LG OLED55B7A? Related Post To LG OLED55B7P vs OLED55B7A : Any Differences that You Should Know? OLED55C6P and 55EG9100 are two 55-Inch curved OLED TVs that you may consider in 2016. OLED55C6P is part of LG’s 2016 OLED TV lineup, while 55EG9100 is part of the older LG’s 2015 TV lineup. As two 55-Inch curved..
LG 55UK7700PUD (55UK7700) vs 55UK6300PUE (55UK6300) : Which LG’s 2018 55-Inch 4K UHD TV Model Should You Choose? LG 55UK7700PUD and LG 55UK6300PUE are two 55-Inch 4K LED TV that introduced by LG as the option for standard (non premium) 4K LED TV from LG’s 2018 TV lineup. Which of them is the one that..
Vizio P55-E1 vs E55-E1 : Which Vizio’s 55-Inch 4K LED TV Should You Choose, P-Series or E-Series? We can find Vizio P55-E1 and Vizio E55-E1 as two options that we should consider if we are looking for 55-Inch 4K LED TV from 2017 lineup. Vizio P55-E1 is the model that positioned higher than Vizio..
Two of the choices that you can consider for 55-Inch 4K UHD TV, especially OLED TV are OLED55E7P and OLED55C7P that introduced by LG as part of their 2017 TV lineup. OLED55E7P is introduced as part of LG E7P model,..